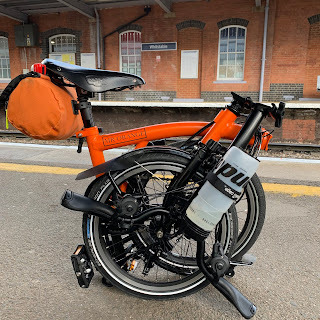 My Orange Brompton: Woe is me on a Brompton! A cry of woe unashamedly came from my lips. I folded my bike up and had to resort to walking with the ordinary plebeians that I had now become. Hurrying home, the bike was put in the boot of my car and I raced to my nearest bike shop. This was less that 30 minutes ago. They couldn't do the repair there and then and I will have to collect it (feeling quite maudlin at this) tomorrow morning. Woe, woe again with an extra dash of woe! How will I cope without my daily joy of using my Brompton? My first thought was to buy a second one! But I know this to be merely a rush of blood to the head, combined with a fit of the vapours! No. I will have to soldier on until tomorrow but like a child trying to get to sleep on Christmas Eve, it will not come quickly. WOE I say...woe! As a wannabe Brompton owner, I have a solution. I think you should purchase a second Brompton, a six speed with, say, yellow frame and bright green forks. I know this will provide you with a dilemma, this is, after all, the Orange Brompton Blog. In the spirit of Bromptonites everywhere, I would be happy to store the yellow and green one for you. It will live securely in Edinburgh, and be available whenever you need it... just hop on a train from King's Cross.